Last Friday, poet and scholar Dr. Edward Baugh paid a visit to Rutgers-Newark. Professor Emeritus of English at the University of the West Indies, Jamaica, Baugh over the years has held many visiting posts in the US and UK, among them at UCLA and Howard University, as well as as Flinders, Macquarie, and Wollongong Universities. Baugh is widely known as ab eminent literary critic whose academic writings focused on West Indian literature, especially the study of Anglophone Caribbean poetry, and in particular the work of Nobel Laureate, Derek Walcott. As part of his visit, I offered introductory remarks, excerpted below. 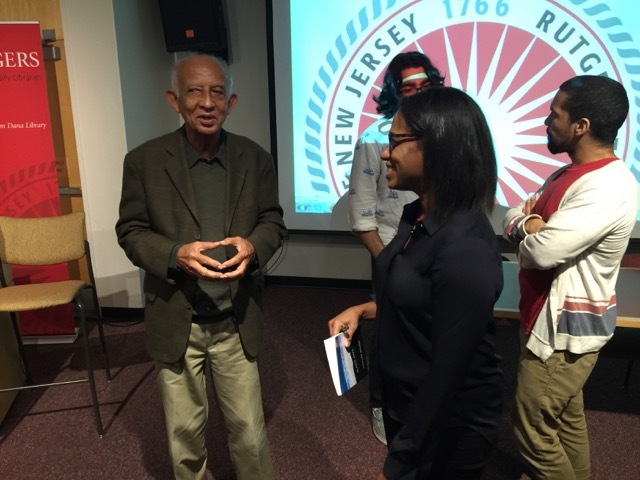 The reading, Q&A and reception drew a strong crowd that included many Rutgers-Newark colleagues and students. Also attending was Baugh's longtime friend, multimedia artist, poet and arts activist Gerd Stern, one of the founders of the legendary arts collective USCO. Stern, I learned, had maintained a home for decades in Jamaica, which is where he befriended Baugh. Edward Baugh's poetry disarms with a quiet power. It does not indulge in rhetorical flashiness or imagistic legerdermain, but rather draws upon the poet's commitment to careful observation and an engagement with the flow of daily life. It is poetry very much of its time and place, of the Jamaica of Baugh's lifetime, and indeed of his life, flavored with everyday speech and the tonalities of the contemporary lyric, but also it is a cosmopolitan poetry that casts a net out to and hauls in perspectives from the wider world, the black and diasporic worlds, the worlds of literature itself. two left feet missing the beat. if there is any word of relief. you can hear the metastases multiply. These are words that do profound work, revealing for and reminding us of poetry's many powers, one of which is portraying the world around us, while another is to reveal what lies deep inside it, and us. Here are two brief poems by Edward Baugh, one rather light and one quite serious, from his most recent collection, Black Sand. They offer only a glimpse of his work, which I recommend, so do consider adding Black Sand to your collection. He is the author of three collections of poetry, including A Tale from the Rainforest and It Was the Singing. His other publications include Derek Walcott: Memory as Vision and Frank Collymore: a Biography, as well as the edited volumes Critics on Caribbean Literature; Derek Walcott's Another Life (ed. with Colbert Nepaulsingh); and Derek Walcott's Selected Poems. and a bird flutters in the bush. and bird is always fluttering." Both poems copyright © Edward Baugh, from Black Sand: New and Selected Poems (Peepal Tree Press, 2013). All rights reserved. It is hard to believe we are nearing the end of the semester, but in a few weeks Thanksgiving will arrive, followed by the last few classes and final papers, and the term will be a wrap. Like prior falls this one has raced by, but the speed has assumed a barreling quality because of the trips to promote Counternarratives, with body underneath the fast-moving cask. Now whenever I get on a plane I wonder in all seriousness how I ever commuted for ten years to and from Chicago, though I must add that when I first started at Northwestern, which was in the immediate post-9/11 moment (2002), dealing with airport security and TSA was nowhere as enervating and exhausting as it is today. It has nevertheless been a joy and honor to be able to read from and promote the book in different cities. In late September, I headed to Baltimore and Washington. In Charm City, Judy Cooper hosted me at the Enoch Pratt Free Library for a reading and Q&A, so many thanks to her and everyone at Pratt (including past Prattizen Reggie H. who made the reading possible). I drew a small but enthusiastic audience, met a number of people, including broadcaster Melvin Lewis, and sold and signed books. Judy and everyone at Pratt were a joy to work with from start to finish. The next day at the invitation of Dr. Meta DuEwa Jones, a professor of English at Howard University, I read to and spoke with one of her classes. It was so encouraging to receive the warm reception and I got to meet several budding writers studying with Meta, a scholar and writer I deeply respect and admire, as well as some of her great colleagues. She was the consummate host from the time I arrived at Union Station until she dropped me. This was an Amtrak trip, and I give it the highest ratings in every category. (Years ago, from 2001-2, I commuted via Amtrak and Greyhound, so I've seen both at their best and worst too.) If only, I thought as I often do when I experience a smooth train ride, we had a real high-speed trans-national rail system. If only! Three weeks later, after the trip to Detroit for Fire & Ink IV: Witness, I headed to the University of California-Santa Cruz to read at the invitation of the utterly brilliant and dear poet and critic Dr. Ronaldo V. Wilson, as part of their "Living Writers Series." Again I was fortunate in my host, as Ronaldo made sure things ran very smoothly, including deputizing one of his talented undergraduate writing students, Oscar Del Toro, to meet me at San Jose Airport. As part of the visit I met with Ronaldo's poetry class, who shared their poetry with me, before we discussed Seismosis and writing in general. 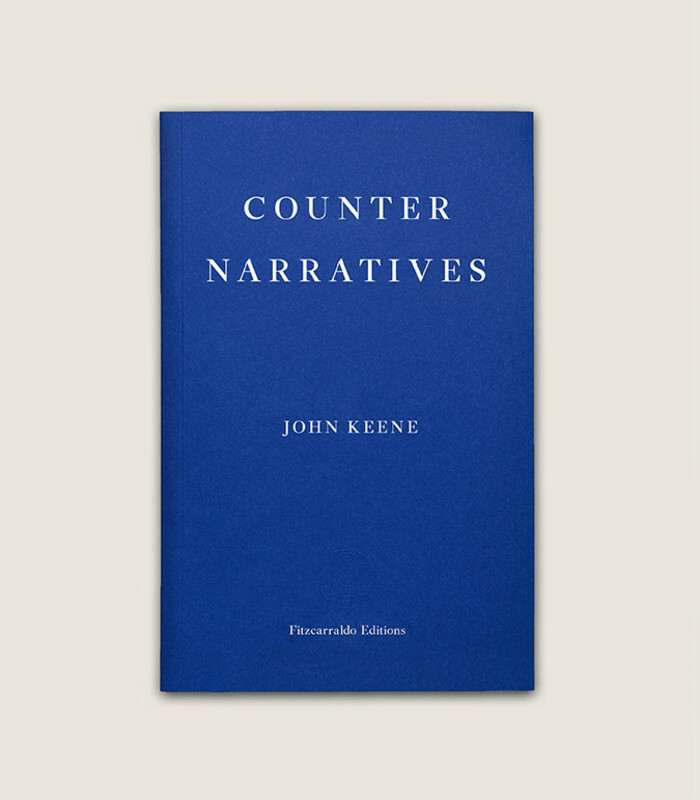 As part of the visit I read from Counternarratives, and sold and signed books, always a pleasure. Ronaldo, who was a delight to hang out with, gave me a little driving tour of Santa Cruz, whose giant redwood trees I cannot get out of my head, and one of the highlights of the visit was meeting the great Karen Tei Yamashita and her Brazilian husband, Ronaldo, as well as other colleagues of Ronaldo's like Chris Chen, his smart and friendly graduate students, and some of the writers who had traveled down from the Bay Area to attend the reading, like Jaze. I also thought about Angela Davis and her presence on this campus while I was there. We also had the experience of a black staff person stopping Ronaldo and me as we walked down a hallway to comment on how rare it was for her to see two black men walking together on campus, so that she had to note this. I appreciated that moment of recognition and connection. A wonderful trip, especially because I of how much fun I had with Ronaldo, and I have promised myself I will not blather on about how beautiful Santa Cruz is. But it is--go see it! The following week C and I headed to San Francisco for several events, under the auspices of the Poetry Center at San Francisco State University. 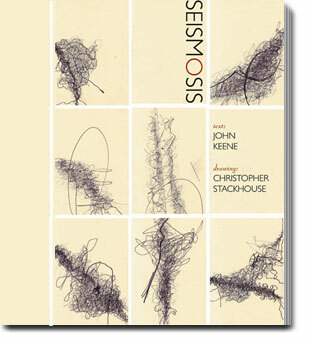 Though I had never read in their series I actually had interviewed aeons ago--shortly after I received my MFA--at San Francisco State, so it was wonderful to be able to return almost two decades later with a new book to share there. Our host was poet and professor Steve Dickison, who from the time he met us at the airport was a shepherd of the best kind. Our first night we stayed in a gentrified neighborhood right on the edge of Golden Gate Park, then we moved to a hotel in downtown San Francisco, right on Union Square, which allowed us to do a little sightseeing and shopping. I had a desire for tunic-style shirts and sweatshirts, and San Francisco was able to oblige me. The reading on Thursday at the Poetry Center drew a full crowd, including Maxine Chernoff, whom I hadn't seen since that interview in the 1990s; Paul Hoover, with whom I once broke bread in Rhode Island and whom I would see from time to time in Chicago; the warm and talented Robert Ricardo Reese; and one of my favorite people, Tonya Foster, who now teaches at the Californi College of the Arts in SF. I also got to meet some local writers and poets, including Brandon Brown and George Albon, who shared with me a copy of his book Fire Break (Nightboat Books). I am leaving out several other people, so I apologize, but it was an afternoon I won't forget for a while. That night Steve, Tonya, C, and I went out to House of Nanking, a restaurant I'd hoped one day to return to, because the food was so good. It is still standing around the corner and down the street from City Lights Books--where we stopped in after our meal and dessert--and just as yummy. Ask for the special menu too! At City Lights, I finally got to meet Tan Khanh Cao, a consummate bookseller, artist and brilliant person inside and out, with whom I would be in conversation the following night at Green Apple Books. I loved meeting Tan, and got such a good vibe that I knew things would go well at Green Apple. Of course I had to be disabused of the notion that the store was in Oakland (??? ), but we got there without a problem via Uber, spending a little time with Tan, Steve, Susan Gevirtz and others (including Paul from City Lights) before the reading. At Green Apple the room was packed, and the audience was truly enthusiastic. Among those present were Green Apple's Stephen Sparks, who introduced us and who has been a champion of Counternarratives from day one; Brad Johnson, from Oakland's Diesel Books, who wrote one of the best reviews of the book; one of my most amazing former students, Tai Little; translator Katrina Dodson; and the dazzling critic Aaron Bady, whom I knew from Twitter. 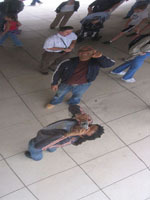 I didn't get to say hello to my former college poetry classmate, Joseph Lease, and his wife Donna de la Perrière, becuase they jetted as I was signing books, but I was so glad to know they were there (I spotted Joseph's nimbus of hair from a distance). The dialogue with Tan flowed easily and was such a pleasure; I believe it's on tape and will be live soon, so I'll post a link when that happens. There were even two St. Louisans present, a lovely young couple whom I got to ask the St. Louis question, "Where did you go to high school." (SLUH and Nerinx Hall, and she was from Webster Groves too--go figure!) Afterwards a large group headed to a local bar and had a great time. While we were in San Francisco C and I got to see my former colleague, the extraordinary Jennifer DeVere Brody, who is flourishing and made our day. I returned to JC and classes a little tired but also still soaring from the wonderful trip. To ALL my hosts, to all who made these readings possible in any way, to all who came out for the readings, to all who have bought and read copies of Counternarratives or given them as gifts, I offer my DEEPEST THANKS ALWAYS! Thank you, thank you, thank you!